Suggested by Destroyer Jason may be pretty good at terrorizing random teenagers, but can he really hope to take down someone as skilled as Mephisto? I think not. Mephisto has fought with some very strong opponents. He may not typically be known as the kind of guy who can go toe to toe with the heavy weights, but he’s still someone who certainly has the edge on Jason. 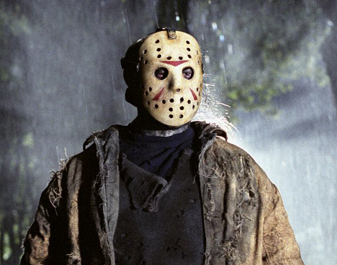 Take away Jason’s blunt weapons and he doesn’t have much going for him. Mephisto wins. The Infinity Gauntlet is definitely a famous Marvel arc at this point and some would say that it could be the greatest of all time. 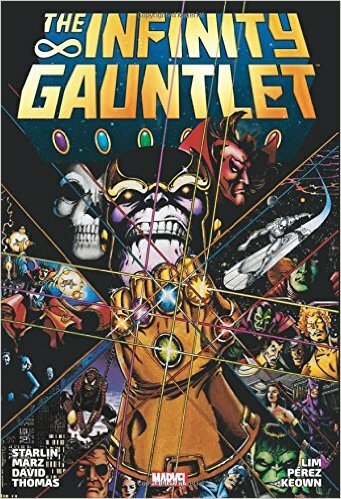 Marvel has quite a few big events though like Secret Wars and Civil War so there’s always a lot of competition, but the Infinity Gauntlet is a story that has aged well and is certainly one of Marvel’s best events. This isn’t just your average trade paperback though. An Omnibus is even longer than an Essential collection and this one is longer than the average Omnibus as they tried to cram in all of the tie ins. This means that the Infinity Gauntlet Omnibus ended up being longer than 2 Essential Collections placed on top of each other. It was around 1200-1400 pages if I recall correctly. Usually that would have taken me forever to finish, but it was a blast reading the classic comics so I read about 400-500 pages in my first batch and then finished it off soon after. Once you start reading, you just won’t want to stop. The collection is essentially divided into 3 parts. The set up to the Infinity Gauntlet, The Infinity Gauntlet, and the Tie ins that take place during the Infinity Gauntlet as well as afterwards. This way, you can say that you’ve truly read the Infinity Gauntlet since you will have seen what came before it and what came afterwards. This must have the record for the most tie in adventures in the shortest span of canon time. What I mean by that is that the tie ins will turn the gap between 2 panels from seconds into minutes as a character will blink and in that blink, have a big adventure. A good example of that is when Silver Surfer misses the Gauntlet when he charged at Thanos in the final part of the Gauntlet adventure and a whole tie in occurred as he raced back. All right, let’s start off with the Infinity Gauntlet plot. I read the first issue a while back so I was familiar with that one, but it’s good to say that I’ve now read the entire epic. The first half is really about the natural disasters that are affecting the planet because of Thanos and then half of the multiverse’s inhabitants are destroyed with a thought. The Avengers realize that they need to do something about this so the heroes who are left decide to attack Thanos once and for all. The big fight is certainly the best part of the arc as everyone runs to Thanos for the big clash. Without the Gauntlet, Thanos has already proved to be stronger than most, if not all of Marvel’s heroes so this isn’t even a challenge for him. 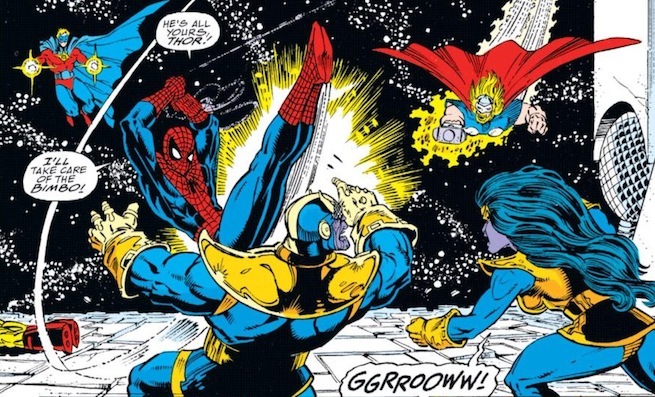 To present the heroes (and readers) with a bit of a fight, Thanos decides not to use the Gauntlet’s full powers against them for a little while. While you know that the heroes are doomed, it is nice to see the action and the heroes do get a few good shots in. They just don’t really deal any damage. The arc takes a bit of a spin when Nebula grabs the Gauntlet as the whole plot shifts since the heroes have to stop her before she does something that they’ll regret. The cool part of this comic is definitely the part where the cosmic fighters show up to challenge her. Thanos states that he would have been able to defeat them, but they do a pretty good job against her as they attack her on all planes of existence at once so that she will not have enough time to think about what is going on. It’s easy to root for Nebula here though since she got a really raw deal for most of the event since she was trapped in a death like state where she was forced to live. Once she grabbed Infinite power, you could hardly blame her for wanting to stretch her new muscles. The Living Tribunal claims that it is not his place to meddle in the affairs of the heroes and villains so he doesn’t make a move here. It’s implied that he could probably end the whole situation if he wanted too, but such things are beneath him and he only interferes when he is angered. Adam Warlock and the Silver Surfer easily have the biggest role in the Gauntlet from the heroes. Adam Warlock essentially has infinite knowledge now that he is back from being virtually dead in the mind gem so he proves to be an ace in the hole for the heroes and Silver Surfer has a lot of experience in dealing with Thanos from his past exploits so he is naturally critical at this point in time. The rest of the heroes are really just there to be a distraction, which Warlock even admits during the latter part of the story. One of the reasons why the Warlock getting unlimited power was so fun was the heroes reaction to this. They had just finished a fairly grueling battle and were exhausted so they were clearly not pleased with having to fight another battle. They half heartedly rushed at Warlock, but he just warped them away. It was a cool twist ending as fans likely didn’t expect something like that to happen. Warlock’s so powerful that the Avengers basically just decided to give up after that. 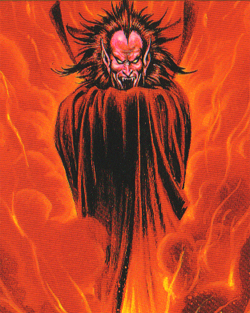 Mephisto is a major player in this adventure, but I’ve never been a fan of his. He’s not very strong so he relies on trickery, but it typically backfires. 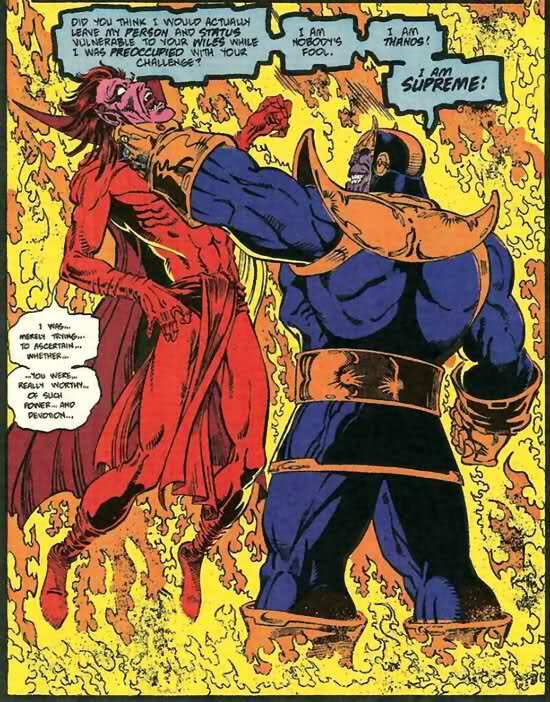 Even when Thanos was getting used to being omnipotent, Mephisto couldn’t gather his courage fast enough to grab the Gauntlet. It was a huge missed opportunity for the demon. He’s always around and Mephisto actually helps the heroes out on quite a few occasions so that he could dethrone Thanos, but things never go his way and he spends the whole arc getting pummeled. Death is a prominent figure here as well, but I definitely don’t care for the character. She never talks and only speaks through her lackey. The lackey talked tough to Thanos so he naturally got the most violent death in the whole collection as Thanos had enough of the guy. The minion was extremely annoying so I wasn’t sad to see him gone. It was unexpectedly intense, but I suppose it was too convey how upset Thanos was. The rest of the collection is fairly tame so it was pretty surprising. If Death could only talk, then I would definitely like her much more, but as it stands, she just looks really arrogant and it doesn’t work since Thanos became much stronger than her. At least Thanos has enough self dignity and honor to not try and control her. He does make a female Thanos who actually defeats Spider Man, which was interesting. I think Spider Man should have won though. Now let’s look at some of the tie in issues. The Sleepwalker got one and I’m not too familiar with the character, but he seems like a decent fighter. For some reason, he’s treated as a trump card at times, but his strength isn’t incredible. He’s roughly a Daredevil-Spider Man level opponent. He helps out a lot on Earth when Thanos starts to wreck the place and his issue is mostly about him keeping the peace while the other heroes are busy. It’s not a bad tie in even if it sounds a little uneventful. Sometimes it’s nice to see what’s happening while the heroes are gone. Spider Man gets an issue where..he actually dies. He successfully helped a kid, but it cost him everything. 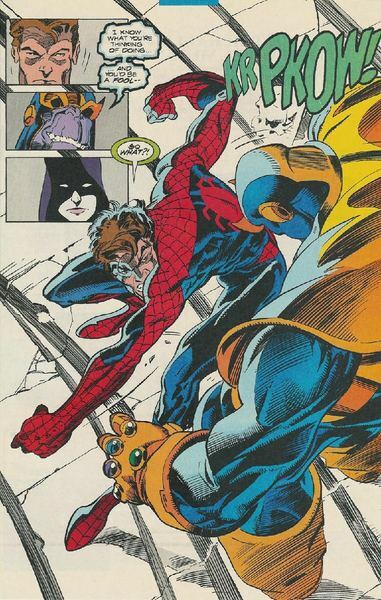 Once he dies, Thanos decides to mess with Spiderman’s soul and tries to give him despair. Spiderman fights back and he has to question what he has been fighting for and if he should continue to live. It’s a very interesting issue and seeing someone cope with their death and wonder what comes next is always cool. In the end, Spider Man didn’t give up hope and managed to reclaim his life. This is yet another example of how Spider Man was written so well back in the day. I shudder to think about how Peter Parker would have acted if this was in the modern days with Slott writing the issue. Cloak and Dagger got their own tie in issue as well. I’m not sure if you realize this blog readers, but I’ve never been a fan of this team. Dagger’s all right, but I feel like she doesn’t have a whole lot of personality and doesn’t use her abilities to their fullest potential. Cloak is constantly going off the deep end and putting everyone in danger when Dagger is gone for any reason. They’re not terrible, but I probably like Punisher more than them…and I’m not the biggest Punisher fan out there. Ghost Rider and Spider Man got to appear in the issue as well so it was definitely packed with heroes! Dr Strange gets quite a few stories. They take place during the Infinity Gauntlet at first and then move on to the after effects. The first issue mainly deals with Dr Strange helping Silver Surfer get back to reality after his mind retreats when he crashed into Dr Strange’s room in the first issue of the Gauntlet. It’s exactly what I’m talking about when I mentioned earlier how a tie in could occur at any time. In the span of a page, a whole issue managed to come forth due to this twist of Surfer not ready to come back to reality! It was a fun fight between the two. After that, Dr Strange got involved with some time travel and fights against other magicians like the Silver Sagger. When Thanos warped all of the heroes away during the first climax of the Infinity Gauntlet, Dr Strange was sent away with Thor and Scarlet Witch to Asgard where they had more adventures. In the final issue, Dr Strange decided to try and defeat Adam Warlock since the infinite power was getting to the wanderer’s head. Dr Strange was incredibly powerful back in the day, but not even he could hope to overpower a wielder of that gauntlet. Still, the attempt was fun and he helped Adam Warlock see reason. Dr Strange is certainly a fun hero and he’s a character who can be underrated at times. He doesn’t always look it, but his abilities are very potent and he knows thousands of different spells. At this point in time, he could actually fight with the likes of the Silver Surfer and Pre Gauntlet Warlock. Those aren’t weak fighters by any means and Dr Strange could really hold his own with any of them. Strange is also a very wise fighter and never begins a brawl without a plan. 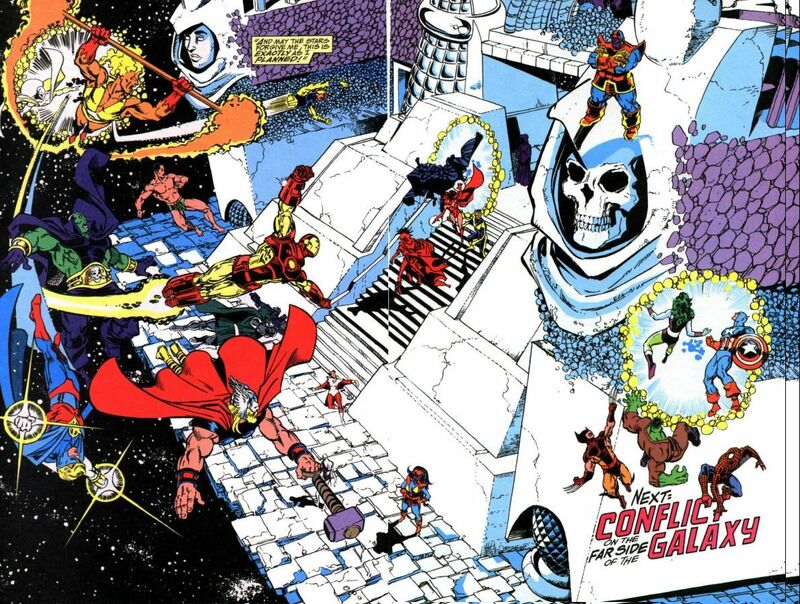 The large array of cosmic fighters is yet another reason why the Gauntlet was so fun. Quasar got some issues as well, but they were apparently forgettable enough that Comicvine didn’t even list them! It’s too bad since they were fun. Quasar got to fight the previous title holders so these other Universe protectors were very tough, but Quasar uses his ingenuity and raw power to take them down. He gets a little bold and heads for Thanos next, but he’s severely outmatched. While Quasar does have the Power Cosmic, he’s never been quite as powerful as the other Cosmic fighters. Still, you should only underestimate him at your own risk as he’s still quite tough. Picture Green Lantern’s energy projection with Cyborg’s strength + Superman’s flight. It’s a very deadly combo. Quasar was a likable guy and he’s very down to Earth. He has a comfy life on Earth while still keeping up with his cosmic duties. That’s definitely tricky and most cosmic heroes wish they could do something like that. Quasar may not help as much as some of the other big heroes, but he still contributes against Thanos and that’s what counts. He probably makes more of an impact in the fight than most of the Avengers! The Hulk gets three issues and they show why he was so upset at being called in during the Infinity Gauntlet story. The events slightly blurred together, but things happened in roughly this order. The Abomination had kidnapped his wife and was sad at how everyone looked at him like a monster. Hulk followed him into the sewers and they naturally had a brawl. One thing led to another and Abomination was able to get away thanks to Dr Strange’s untimely summons. Hulk was able to get back and was turned small so he used this opportunity to act as the Abomination’s conscience and convinced the guy to stop what he was doing. The Abomination let his wife go and went back to the shadows, sad at how his fate had treated him. Hulk then went on to help a town that had been overcome with rage. This is the Hulk who is basically taken over by Bruce Banner and essentially speaks perfect English. He’s not quite as strong of course, but he gets the job done. I can’t say that he looked very good in the Infinity Gauntlet, but that’s mainly because he’s simply outmatched by the other big villains at this point. He may have complained, but he still helped out when it counted. The Thanos Quest is easily one of the best extras to be included here. It shows how Thanos defeated all of the Infinity Gem guardians and gained the Gauntlet’s power. Each member of the group was extremely powerful so Thanos had to use his wits to win. When physically outmatched, you have to be very cunning to claim victory. These issues would have likely gotten a 9 on their own. In particular, I loved the fights against the speedster who could move at speeds much greater than light and the physical powerhouse who could likely give the Hulk a run for his money. That being said, the fight in the computer game against the game member was a lot of fun as well. Those issues really captured the intelligence of Thanos. It’s not something that’s played up too often and I don’t expect to see a whole lot of that in the films or TV shows, but it’s one of the reasons why Thanos is so deadly. He essentially has the combat expertise of Batman with the strength of Superman. That’s not even counting his many energy attacks and how well he can use the Gauntlet. While Nebula was overwhelmed on the 3-6 planes of existence, Thanos explains that he could have been able to fight on all of them at once. He simply can’t be stopped and will forever be one of Marvel’s heavy hitters. Finally, we had the onslaught of Silver Surfer issues. To put them into perspective, just adding all of them together would have been enough to fill 6 of the average trade paperbacks. They cover a whole lot of content and most of them deal with the Thanos plot which is cool. 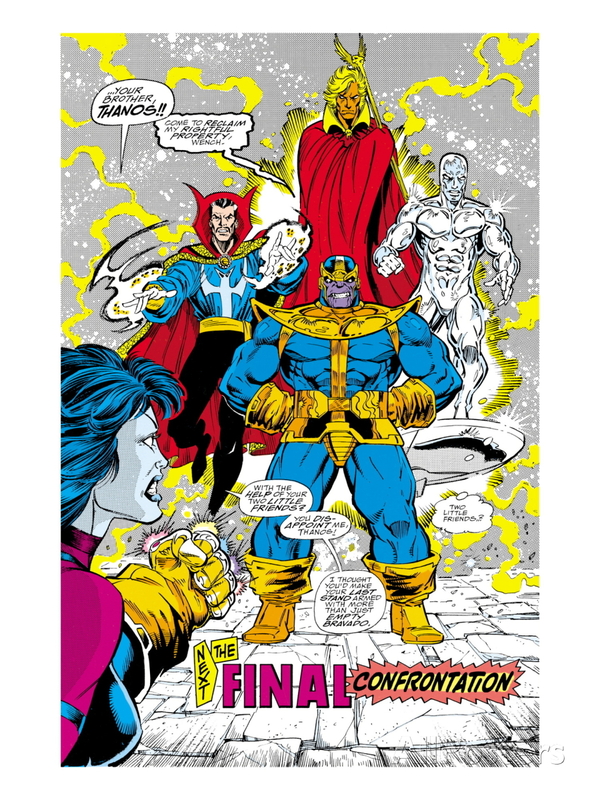 The majority of the issues take place before the Infinity Gauntlet and technically, the Silver Surfer is the first person to learn just how dangerous Thanos is. He follows the Titan across solar systems and many planets, but it’s actually a very depressing journey for the cosmic speedster. Even when he does catch up to Thanos, he is quickly crushed each and every time. He cannot even hope to beat avatars of Thanos. That being said, the prophecy states that the Silver Surfer is the only threat to Thanos so the Titan is always very cautious with him. In a way, you could say that the Silver Surfer is the main character of the arc and I would completely agree. Almost half of the collection is comprised of Silver Surfer comics and he naturally appears a lot in the main series as well. His plot also connects with Drax’s as they meet up and are forced to team up on many occasions. They even have a lengthy battle in one of the issues. Silver Surfer is clearly stronger, but Drax is almost possible to destroy so it’s effectively a stalemate. This was back when Silver Surfer was a complete powerhouse and I don’t really see how Thor or Hulk could compete with him at this point in time since Thor was going through one of those phases were it wasn’t the real Thor and the Hulk lost most of his power. The Silver Surfer nearly ended the whole Gauntlet arc on his own if he had not missed the Gauntlet. Thanos didn’t dodge, the Surfer just missed because he was going way too fast. If only he had time to practice before the big play. Still, he kept it close. As with Warlock, I enjoy the Silver Surfer’s character a lot. He never really wants to fight, but when pushed he can really deliver some spectacular action. It’s admirable that he always tries to find the peaceful way out of a situation, but things just don’t work out that way for him. He doesn’t get to appear very often in the current comics, which is too bad. Hopefully he will get popular again once he starts to appear in the Fantastic Four sequels. Drax got a really big role, but it just served to remind me that I don’t like Drax in any incarnation. I really don’t like the new Gladiator form of the character, but I am not a huge fan of the old form either. It’s a big improvement of course and he means well, but he’s typically pretty clueless about what’s happening and while he was made to destroy Thanos, he’s severely outmatched the during the entire collection. As for some of the other characters who appeared, Thor was one who was really hurt by the time at which the comic was written. This was still the era of the fake Thor so he wasn’t very cool or regal like the real thing and his power levels weren’t as impressive as the should have been. Even in his weakened state, the heroes mentioned him as a trump card so I would have really liked to have seen the real deal fight a little. Likewise, this wasn’t the Hulk that we were used to seeing. Cyclops and Scarlet Witch launch a nice two pronged attack on Thanos, which is completely ineffective, but it was fun to see them try. The X-Men were really a total nonfactor here. Vision also tried his best to stop Thanos, but this was during his ghost days so it didn’t go too well. Captain America had his famous moment where he walks up to Thanos and it is a cool scene, but it’s too bad that the fight couldn’t be longer. 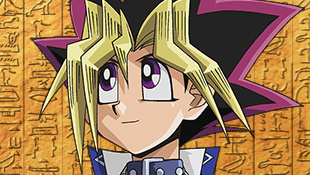 I suppose that it would have been a lose-lose situation though since I may have had to talk about plot hax a little. There is plot hax here of course, but that goes without saying so I didn’t even mention it. The only good explanation is that Thanos wanted to lose, which I still find a little iffy since Nebula should have won in that case, but we’ll let it go there. The plot hax is self evident enough that I don’t really need to talk about it much. It was funny to see Thanos just retire on a farm after destroying half of existence. He certainly got off easy eh? Naturally, all of the cosmic entities minus the Living Tribunal also get a big role. Thanos manages to take down each and every one of them. The Celestials, Galactus,The Elders of the Universe, and many more. Finally, Eternity showed himself since he’s apparently much stronger than all of those (But significantly weaker than the Living Tribunal) but Thanos also takes him down without too much effort as well. It’s a stunning battle with great feats and scenes of action. The cosmic fights alone would be enough to justify this arc as a living legend. This Omnibus also exposes one of the areas where I actually believe that Marvel surpasses DC. How can this be possible right DC fans!? Well, DC’s never had much of a cosmic scene. We’ve got the Anti Monitor and the Source…but that’s about it. There’s an argument to be made for the Green Lanterns, Darkseid and his armies, as well as the New Gods, but I’m not sure if I really buy it. They just feel more like aliens and other heroes as opposed to cosmic fighters. Take Orion for example. I don’t see any difference between him and a regular hero while fighters like Adam Warlock and Silver Surfer have that dignified cosmic air about them. So, while I do still think that DC has the overall better characters, Marvel has a much better cosmic scene so they can have events like this. DC’s a little more limited when you leave Earth. That being said, the Marvel cosmic part has weakened a little in recent years. Not literally, but the cosmic events start to be a little more underwhelming when everyone has infinite power. Now we’ve got kids and horned creatures who can rewrite whatever laws they want. When everyone is a cosmic being who can do anything, the whole concept starts to lose its shine. Luckily, most of the cosmic beings who are too overpowered weren’t in Infinity so that one still sounds like it should be a fun remake/reboot of the Infinity Gauntlet. I doubt it can beat the original, but it would still be a lot of fun to see how the new version is. Meanwhile, DC needs to bring back the Angel from the JLA series as he’s one of the only cosmic beings that they’ve got. Putting him and the other Angels up against the Justice League would be a fun arc to read. Poor Mephisto is going to have to take another loss here. He’s definitely not at a level where he can hope to challenge Dabura. Dabura was holding his own against SSJ2 (Debatable) Gohan and he can certainly take out a planet with ease. Mephisto wouldn’t have time to blink before Dabura would already be unleashing a killer combo on the demon. This is definitely a one sided fight, but now Mephisto can have a little breather before he returns to the blog. Dabura wins. 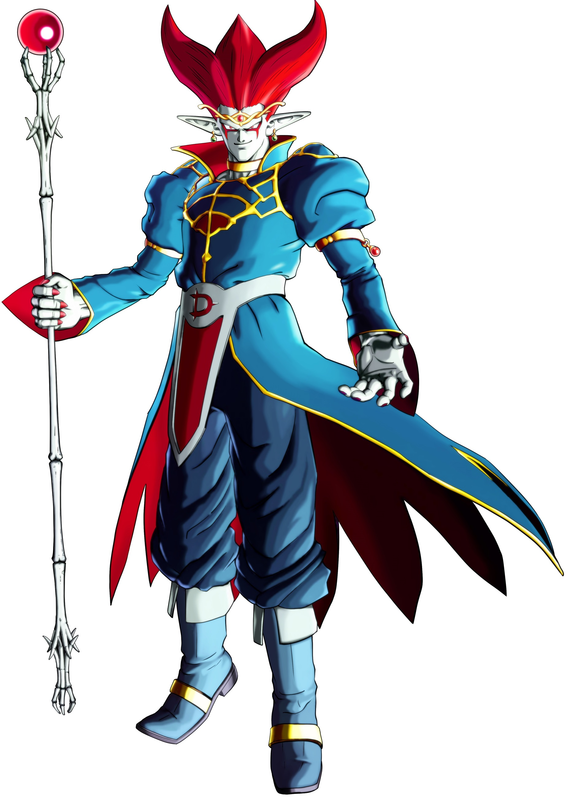 Demigra makes his debut onto the blog and he’s certainly one of the stronger DBZ villains of modern times. 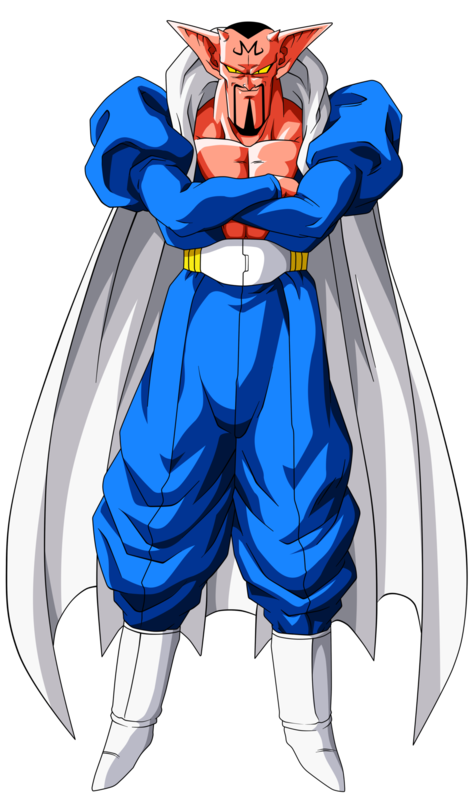 He was able to overwhelm Goku post God Mode boost and was taking out the combined forces of the Z fighters for a while. While he knew that he would lose against Whis, simply fighting him on any kind of level could be considered a feat as well. With a super form at the ready just in case, Demigra is way beyond Mephisto in terms of power and speed. Mephisto is simply doomed here. Demigra wins. Elsa is a powerful ice user, but ice is not the best attribute against Mephisto. Mephisto also has much more battle experience under his belt, which gives him a pretty decent edge. Elsa may grow stronger in the Frozen sequel coming up, but at this point, I don’t see her being able to take Mephisto down for the count. The demon lord is simply too powerful. Mephisto wins. Adam Warlock is back once again and now he’s up against Mephisto! Mephisto isn’t really as impressive as he makes himself out to be. Adam Warlock definitely outranks him and by a large margin. One cannot compare their levels of power and Adam Warlock is the better fighter in close combat. I would also take him in a beam struggle. Mephisto will have to drop down the ranks with this loss. Adam Warlock wins. This is a pretty big battle and it also happens to be the blog’s 12400th post! That’s a pretty cool milestone and it means that we must think about this battle carefully. Silver Surfer possesses the Power Cosmic and one good blast can eradicate most enemies. 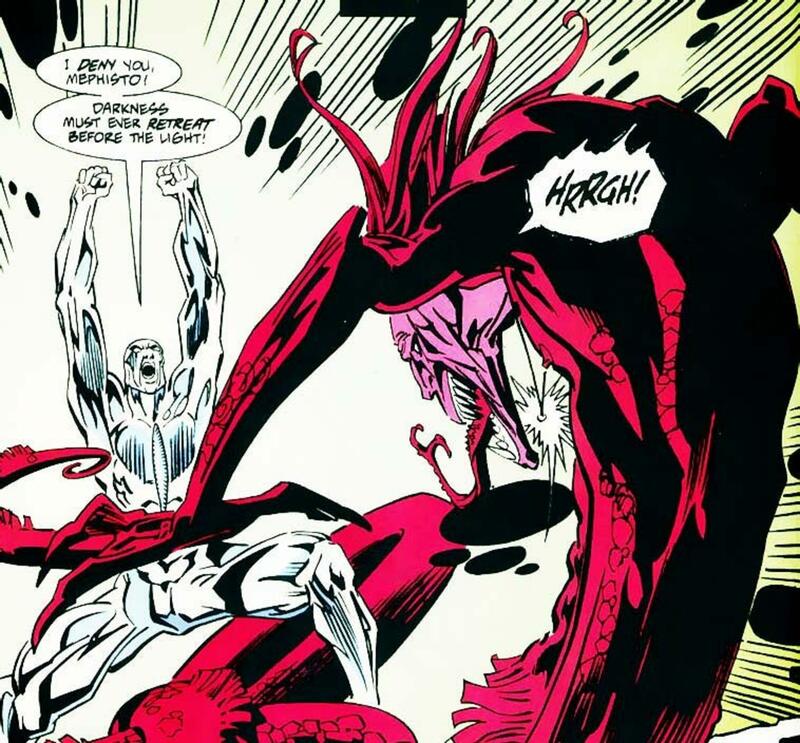 Mephisto is strong, but his darkness will not be able to penetrate Silver Surfer’s light! The Silver Surfer takes a solid win and he moves up the blog ranks. Silver Surfer wins. Blackheart and Mephisto are both pretty powerful demons in the Marvel Universe. While Mephisto may seem to be a lot stronger since he’s higher up along the food chain, he hasn’t gotten to fight as much as Blackheart. Blackheart was a playable character in the MVC2 fighting game and he has a lot of attacks. Physically, Blackheart is very powerful and he’s a much better fighter than Mephisto. Mephisto has energy attacks, but so does Blackheart. Youth will usually trump the hierarchy. Blackheart wins. Mephisto is strong to be sure, but he won’t be winning this round. Thanos is far stronger than Mephisto and he’s a better hand to hand fighter. 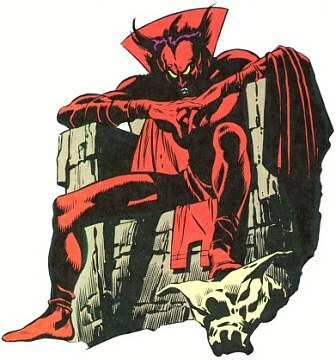 Mephisto is good from long range, but not quite as good as Thanos. Thanos has attained many abilities over the years and they have given him a solid edge. Thanos wins.